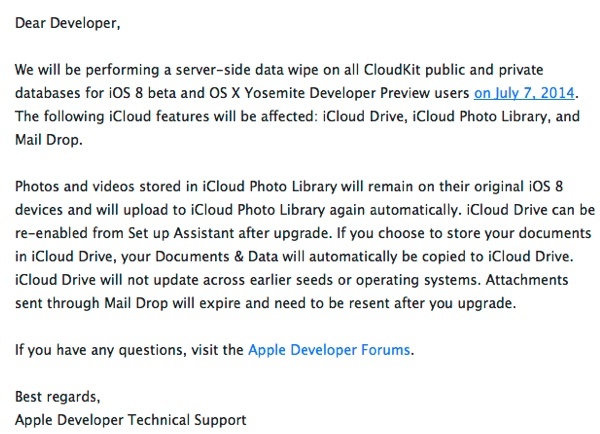 Apple has notified developers of plans for a server-side data wipe on CloudKit public and private databases for both the beta versions iOS 8 and OS X Yosemite. The wipe, which will take place on Monday, July 7, will erase data for iCloud Drive, iCloud Photo Library, and Mail Drop. The wipe comes just a day ahead of the rumored launch date of iOS 8 beta 3 and also the likely launch date of the third Yosemite Developer Preview. Apple commonly seeds early versions of its iOS beta operating systems on roughly two-week intervals, moving on to three-week intervals later in the testing period. OS X beta updates have followed a similar update pattern in the past as well. Apple's second iOS 8 and Yosemite betas came approximately two weeks after the software was first provided to developers at the Worldwide Developers Conference, and it has now been three weeks since those updates were seeded. Both iOS 8 and OS X Yosemite are expected to be released to the public in the fall, after an extended beta testing period. Wipe away! Hope nobody needs their saved data who is out of town or out of office on vacation for the 4th of July Holiday. This is probably the closest we'll ever get to Apple confirming the release of a beta prior to it actually showing up. Honestly, no one will probably even have this problem. People who are using iCloud drive is probably just using it with test data. Although I have a feeling that this notice was sent out yesterday morning and it took to now till the news to come out. Or Apple just don't care it is the 4th July weekend, since most people in the world don't have a long weekend like Americans do. This tells me 10.10 will have the dark theme come Tuesday. Ugh. This tells you nothing. So does this mean all my photos currently in photo stream will be gone? Essentially starting all over again in iOS 8 right? Or am I missing something? Photostream is your last 1000 photos and doesn't count against your iCloud storage allowance and is also not accessible beyond allowing you to sync photos across devices. iCloud Photos is the new Yosemite / iOS 8 "upload all your photos to iCloud to backup/share them" functionality and does count against your storage allowance along with the new iCloud Drive general storage functionality. It is the new iCloud Photos / Drive that are being wiped which are both beta features. That's what it means. If you keep local copies they won't go away. Just the cloud stuff. Anyone else smelling the public Appleseed beta? I have iCloud Photo Library turned on but all my photos and videos will stay on my device and just re upload to iCloud again...correct? If you have to ask and don't understand the email you were sent by Apple, you probably shouldn't be using it. If anyone needs their saved data, then it's their own fault for not reading the developer terms, which clearly state all over the place that you cannot rely on Apple's pre-release software for any production work. Right now it's for developers only. Yeah they will BUT I'm a little concerned with this approach. Since I'm currently using iCloud Photo Library, my iPhone no longer has a full-resolution version of all photos. That's one of the advantages of using iCPL -- it saves a tremendous amount of local device storage by only saving a thumbnail and low-res version of the image for everything except recent photos (less than a couple days old). So, if they wipe out the iCloud version and expect my device to transfer the full-size images up again, we're going to have a problem. All of the data should be test data, including pictures. If you chose to use the BETA as your daily driver that is your problem not Apples.